Updates and Live Stream Will Return on March 10th! While the Foxwoods Poker Classic is well underway, we are unable to have live updates and live stream begin until March 10th. Unfortunately, WhoJedi is off site until then. However, he will be back on the 10th to bring you all the photos, videos and live streams from the Series. 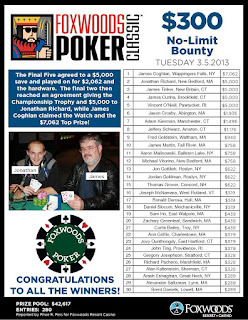 Until then, be sure to check here for all of the results of the events as well as a link to the full Foxwoods Poker Classic schedule at the top of the page. Good luck and see you this weekend!